In the previous post of this series, we reviewed the System Requirements for the SCUtils Knowledge Base add-on. In this post, we will walk through the Installation steps of the product. Depending on how your Self-Service Portal has been installed/setup, you may have the SharePoint website and the Web Content Server hosted on the same server, or you may have the SharePoint website and the Web Content Server hosted on different servers. Both of these scenarios are supported by the Vendor, and I will include the steps for both (provided by the Vendor) in this post. Start by registering on the Vendor’s site, then you will be able to download the Demo version of the product (currently at version 3.3). Copy the installer file SCUtils KnowledgeBaseDemo v.3.3.msi to the Self-Service Portal SharePoint Website server. Run the installer. On the License Agreement screen, agree to the terms, and click Next. On the Installation Folder screen, either accept the default location (C:Program FilesSCUtilsSCUtils KnowledgeBaseDemo) or change the location as applicable. The Vendor documentation does not indicate whether or not to change the “Install SCUtils KnowldgeBaseDemo for yourself, or for anyone who uses this computer” option. Therefore, I will accept the default selection of “Just Me“, then click Next. Once the installation is complete, click Close. The installation folder will open automatically. From the Installation Folder location, run the DeployWSP.exe installer, with Administrative rights. This will install the Web Part into the SharePoint website. Once the installation is complete, you should see the following in the command prompt. Press any key to close the window. 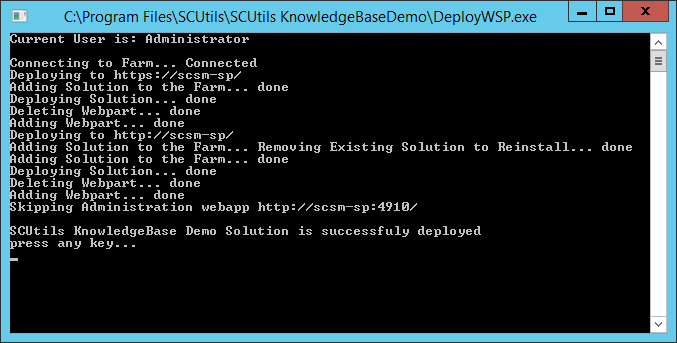 Copy the installer file SCUtils KnowledgeBaseDemo v.3.3.msi to the Self-Service Portal SharePoint Web Content server. To confirm which server is the SharePoint Web Content server, launch Internet Information Services (IIS) Manager and check for the website named SCSMWebContentServer. Run the installer. On the Welcome screen, click Next. Once the installation is complete, click Close. The installation folder will open automatically. Close Windows Explorer. Now that we have the SCUtils Knowledge Base add-on installed, we need to do some post-installation configuration to be able to use it. In the next part this series, we will cover the Post-Installation steps for the product.